Mt. Ijen is home to its famous blue flame. These flame are caused by the extreme heat from the sulfur that is emitted from the man-made channels directly from the walls of the crater. And by the time darkness consumes the light, a spectacular, magnificent, extremely worthy reward awaits the tourists that flock the mouth of the volcano. Ijen's blue flame. Tourist climb to see the blue flame, miners climb to harvest sulfur. When it was our turn to climb to the peak from where the mouth of the crater is and eventually hike down to where the blue flame is, I cannot deny how tough it was for us. Physically demanding is the fitting word, I would say. But as tourist comes and another batch goes, I see miners going up and down with us. We looked excited but the miners seemed like it was just the ordinary day with that straight face and a slight exhaustion evident from the wrinkles around their eyes. Finally! Alas! The blue flame. It was such a pleasure indeed but then I saw something between the flame and the thick smoke. A sulfur miner. With only a shirt covering their face, a torchlight around their forehead, and some tools to break the formed sulfur. The journalist in me said to go closer, as close as where the miner is. I tried but I failed. I was pushed away by the huge smoke that is obviously hard to breathe in and annoyingly painful in the eyes. Our guide then called me to his side and asked me to wear the gas mask he brought. So that’s what it’s for, I said to myself. I can't help but wonder, how in the world can these miners withstand these lung killing smoke? It’s a health hazard and anyone who’ve been there would agree with me 100%. A sulfur miner appears minuscule against the enormous gas engulfing the landscape. A miner prepares his freshly harvested sulfur on a basket which he will carry to the peak where other miners await him. These men have to work as early as 12:00mn mining for sulfur. Climbing up to the peak of the crater is only part of what they have to go through. Once they worked their way up, the miners then have to descend down the steep crater straight to the mining area where they break chunks of sulfur that later they have to carry back up. They carry up to 100kg, and to make it tougher for them, flocks of tourist block their way up making the climb more agonizing. Once on top, they will have to transfer the sulfur to a wagon to be transported through the steep terrain down to the foot of the mountain. They do this two to three times a day for 8 to 15 dollars. 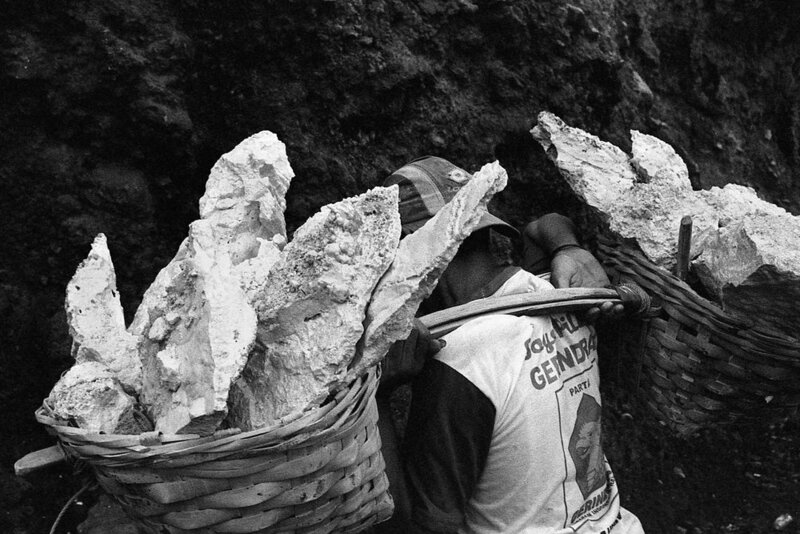 A miner carrying a basket full of sulfur that is estimated to be 70kg in weight. I tried carrying one of the baskets filled with sulfur and I cannot even lift just an inch of it from the ground. What seems daunting seemed simple by the miners with their thickened skins and bruised shoulders. 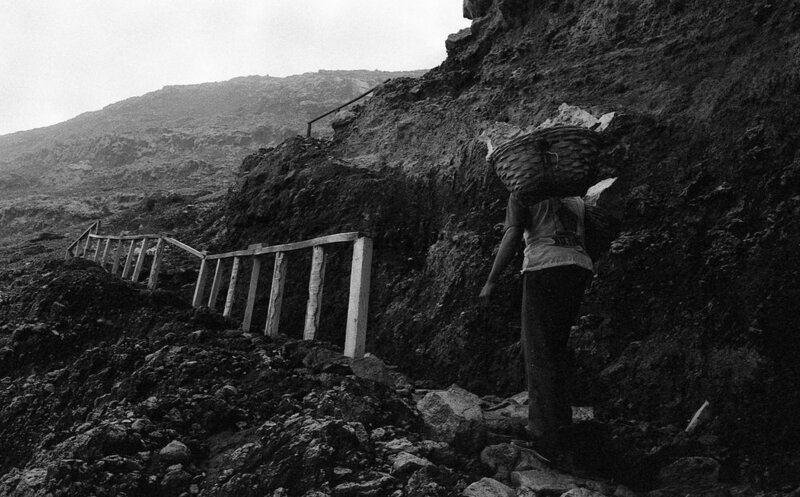 A miner hikes an uneven terrain back to the summit with the sulfur he mined across his shoulders. It was a tough climb for a tourist like me who was not prepared with the energy required to go up and down the crater and the trail, but because this is the job that the miners have to deliver, they have to overcome it. They have a family to feed back home waiting for them. The miner reaches the peak of the crater. He will then proceed to pass the sulfur rocks to other miners that will then carry the collected sulfurs with a wheelborrow down to the foot of the mountain to be weighted and get paid. It was an eye-opening experience for me and to be honest, I felt ashamed that I had to be there walking side by side on the same steep and narrow path with the miners. I wanted to witness the spectacular blue flame from the emitted from the sulfur deposits but at the same time I know I’m getting in the way of the miners. I’m not really doing any help to their already physically challenging job. It was a pleasure to see such a marvel that the planet had to offer but I can’t help but wish good fortune and more support from the community and the government for the miners working night and day to feed their families. and photography related contents. See you on the street!